Models dressed as princesses, princes, palace maids, and eunuchs appear around the palace grounds to create the ambiance of the past. Many traditional games such as playing cards and poetry quizzes, along with imperial art shows such as royal court music and traditional plays help people experience the life in the palace a long time ago. Nestled under the majestic Ngu Binh Mountain and stretching along Huong River, Hue City is also famous for its history and culture. What better way to discover this beautiful culture than through Hue Festival! Rising from the initial success of the Vietnam-France Gathering in 1992, this event attained its official name “Hue Festival” in 2000. 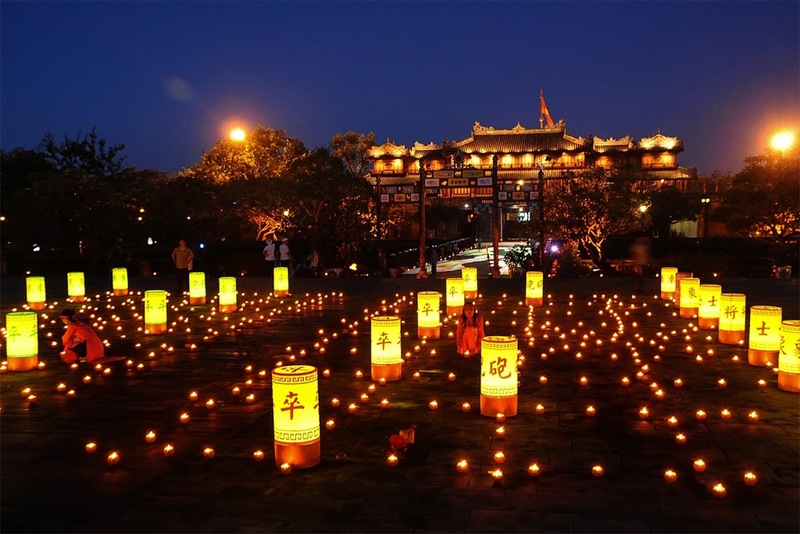 From 2000 to today, Hue City celebrates eight festivals every two years in April. 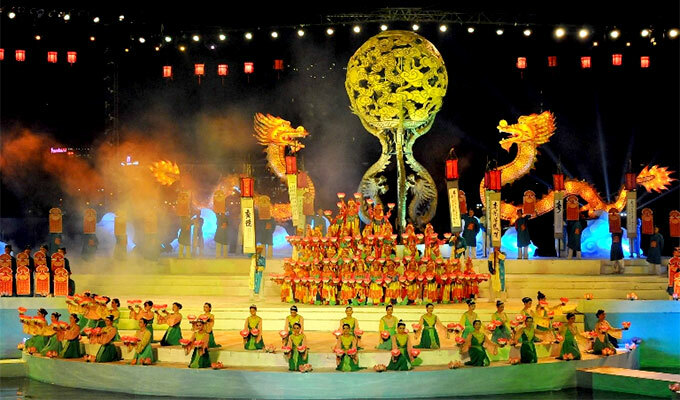 Hue Festival is a culture and tourism event, which is the first national and international festival of Vietnam. 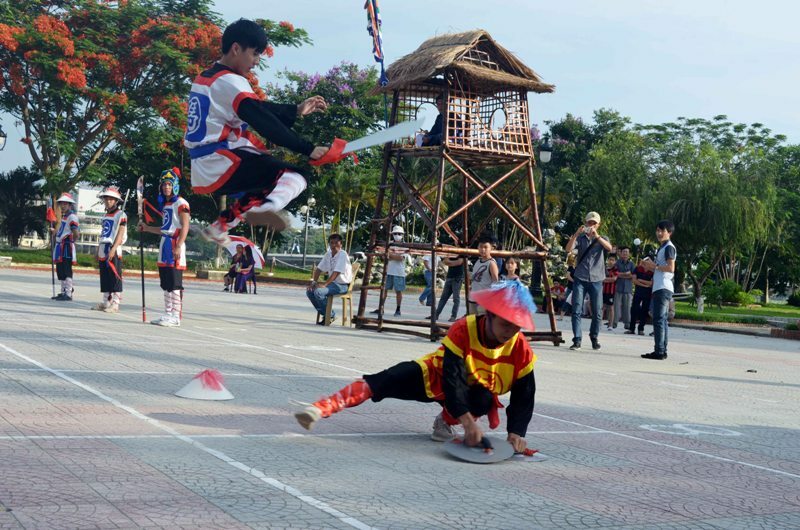 Every festival has a variety of traditional activities, which honor the unique cultural values of Vietnam in general and the ancient imperial city of Hue in particular. With the participation of international performing art groups, an abundance of interesting performances from all over the world, you won’t want to miss this festival. Many domestic and international tourists are fond of the special performances and are waiting for the next festival with its different theme and special activities. As I said above, Hue Festival is organized every two years, which means there is no Hue Festival in 2019. But don’t be disappointed! 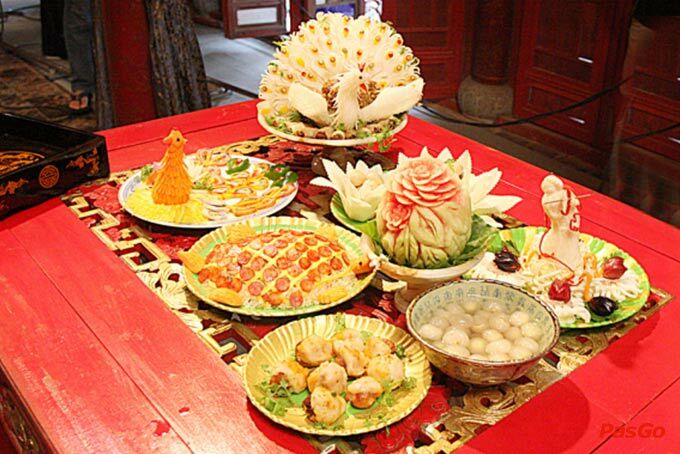 Hue Traditional Craft Festival will be held this year and this festival is organized every two years as well. Therefore, regardless of the year, there will always be an exciting festival to check out! 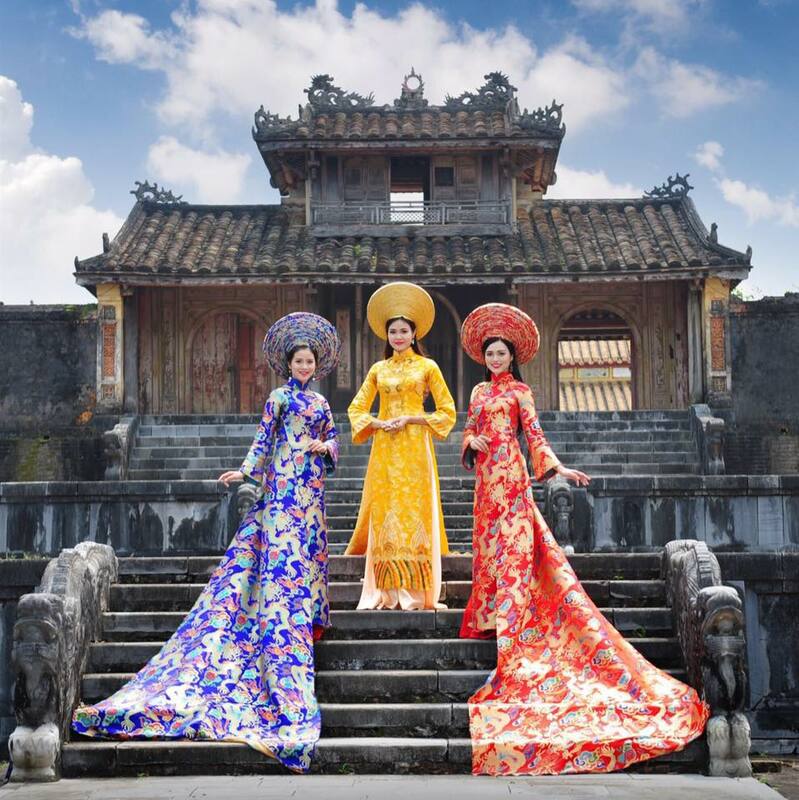 The eighth Hue Traditional Craft Festival in 2019 with the theme “The Quintessence of Vietnamese Crafts” will take place from April 26th to May 2nd. 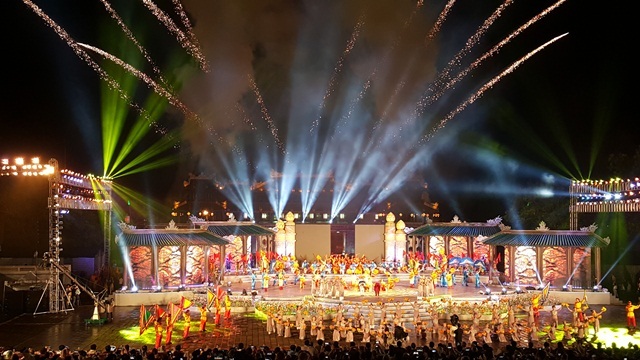 After the success of the previous festivals, the 10th Hue Festival was held from April 27th to May 2nd, 2018 with the theme “Cultural heritages with integration and development – Hue, one destination, five world heritage”. Hue, the imperial capital of Vietnam for hundreds of years, is honored to have five world heritages recognized by UNESCO. They are the Complex of Hue Monuments, Royal Court Music, Woodblocks of Nguyen Dynasty, Imperial Records of Nguyen Dynasty, and Royal Literature on Hue Royal Architecture. 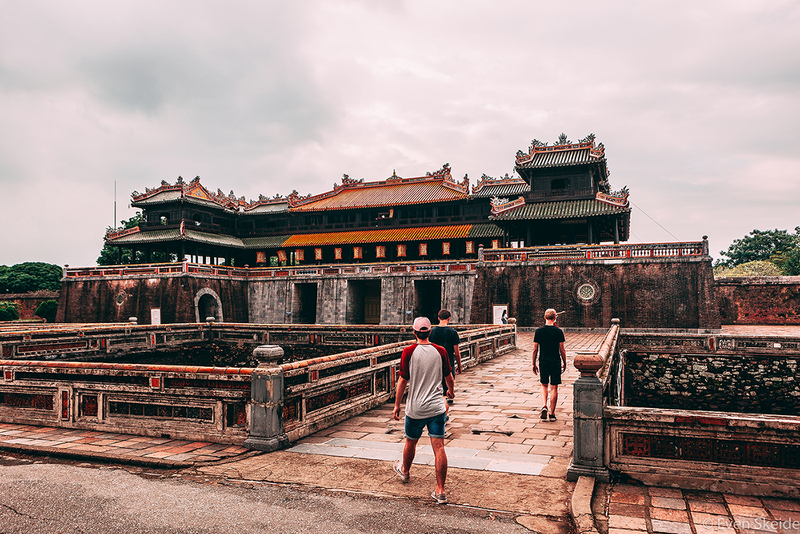 The Complex of Hue Monuments, recognized by UNESCO in 1993, was built during the Nguyen Dynasty from the 19th to 20th century, located in and around Hue City. The complex includes administrative and military buildings of the empire, the imperial residence, and related royal palaces inside the city. Temples and royal tombs are located on the outskirts of the city. Royal Court Music, recognized by UNESCO in 2003, was performed at annual ceremonies, including anniversaries and religious holidays, as well as special events such as coronations, funerals or official receptions, by highly trained and skilled court musicians. The Woodblocks of Nguyen Dynasty, recognized by UNESCO in 2009, is a documentary heritage item. It is a collection of 34,555 plates of woodblocks made during the reign of the Nguyen Dynasty in which are engraved various records from official literature, history, classic, and historical books. Imperial Records of Nguyen Dynasty, recognized by UNESCO in 2014, are royal administrative documents approved in red ink by kings of the Nguyen Dynasty (1802 – 1945), the last feudal dynasty in Viet Nam, including records of grass-roots and central administrative organizations submitted to the kings for approval, records created by the kings, diplomatic notes, and literature composed by the royal family. Royal Literature on Hue Royal Architecture, recognized by UNESCO in 2014, consists of the system of verses and characters in Han scripts carved, inlaid, enameled, or covered in alto-relievo with plaster, porcelain, and terra-cotta on Hue royal architecture relics under the Nguyen Dynasty. Having nearly one hundred traditional programs from Vietnam and countries all over the world, I have compiled for you a list of ten important programs, which have the most culturally informative features, along with their timelines and locations. Considered as the remarkable program of the Hue Festival 2018, Van Hien Kinh Ky is a comprehensive art show, which combines a variety of elements: dance, chorus, animation, poetry, and music. This heroic historical story about Vietnam in the 19th century is mainly written in the art of royal art and Hue traditional art to highlight the topics: the construction of the capital, the implementation of national sovereignty, unity of territorial integrity, and peaceful life with the values created by a civilized and independent country in the history of the nation. This program is held at 7:15 PM, on April 30th, at Royal Palace (Dai Noi). 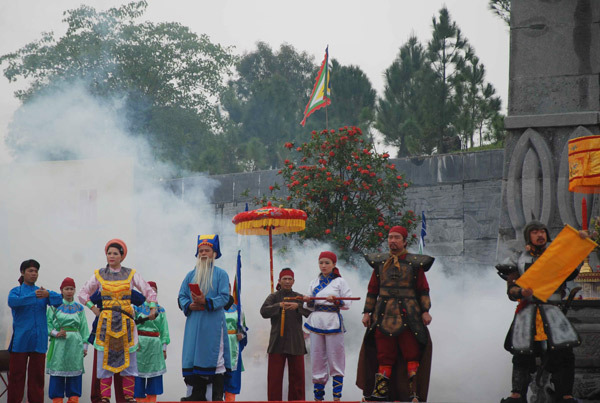 Models dressed as princesses, princes, palace maids, and eunuchs appear around the palace grounds to create the ambiance of the past. Many traditional games such as playing cards and poetry quizzes, along with imperial art shows such as royal court music and traditional plays help people experience the life in the palace a long time ago. However, the highlight of the program is the Royal Banquet, served with delicious dishes elegantly decorated and imbued with Hue identity. You definitely can enjoy the right ambiance, melodious music, and awesome food right here. This program will be held at Duyet Thi Duong Theater (Royal Theater), at 7:30 PM from April 17th to May 2nd. Pro tip: The Royal Banquet Program has a limited capacity, so you need to book a table in advance. “Hat Van” or “Chau Van” is a traditional folk art of northern Vietnam which combines trance singing and dancing. It originated in the 16th century and spread quickly. Its music and poetry are combined with a variety of instruments, rhythms, pauses, and tempos. The main musical instrument used in hat van performance is the moon-shaped lute (dan nguyet). The genre is famous for its use in rituals for deity mediumship. The national competition of “Hat Van” or “Chau Van” includes a succession of special items held all day, from April 26th to 29th at Culture Center of Hue City (Trung Tam Van Hoa Thanh Pho Hue). For Hue Festival 2018, the Buddhist Center of Hue City organized a Buddhist music and dance show with the theme “Shining Beliefs”. The program was a combination of floating lotus flower paper lanterns on Huong River and praying for a safe country and peaceful life ceremonies. The event was held at 8 PM, on May 1st at Da Vien Bridge Park (Cong vien cau Da Vien). Street performances themed “Cultural Colors” includes many traditional performances of countries around the world. Each arts group will perform their dance and song with the traditional clothes of their country. Street performances are held at 4 PM from April 28th to May 1st on the main streets of Hue City. Get there on time and don’t miss these outstanding performances. The ao dai is a traditional style of clothing of the Vietnamese, which is usually used for both traditional ceremonies like a wedding and modern life as the uniform of female students in high school, female teachers, and female staff in banks. The Ao Dai Performance is a unique show of hundreds of types of ao dai, from the old-fashioned style of the 19th century to the modern styles of today. Representing these beautiful clothes are famous models, beauty queens, designers, and beautiful girls on the gorgeous ancient stage at Memorial Stele in front of Quoc Hoc School (Bia Quoc Hoc). The Ao Dai Performance was held at 8 PM on May 1st. Imagine kite designs emulating the flying insects, birds, and other beasts, both real and mythical, in the air above you. The finest kites are made from split bamboo (usually golden bamboo), covered with silk (or printed polyester), and hand painted. The kite symbolizes the childhood of the Vietnamese. It is a symbol of peace, freedom, and desire, expressing the dream of humans to reach the sky. Let me paint this picture for you: green rice paddy fields stretch to the blue sky while children ride buffalo, a kite in hand lapping up the breeze. This is the countryside of Vietnam, a tranquil scene! Local people and organizations will make beautiful kites with different sizes and designs for the Kite Flying Festival. The abundance of colorful kites in the sky is a special spectacle that you should not miss. Kite Flying Festival was held all day, from April 27th to May 2nd, at Phu Van Lau. Local people in the villages usually organize sampan races before the new season as part of their spiritual activities in order to pray for good weather. On the day of the race, colorful sampans collect on the shore of the river, villagers gathering there in anticipation, and the teams look seriously on in uniform, ready to start the competition. On the banks of the river, people gather and cheer for the team in a thunder of drums. The traditional Sampan Race was held at 7 AM, on May 2nd, at Ly Tu Trong Park. The Human Chess Competition is one of the outstanding folk games that take place in many festivals of Vietnam. This game is not only for entertainment but it’s also full of spirit and wisdom. Human Chess is actually a Chinese chess game played with people instead of chess pieces. The chessboard is usually a large yard or pagoda. Each game begins with 32 troops, including 16 men and 16 women. Before entering the field, the team dances with the flag to the rhythm of the drum and flute. Each time the enemy troops win, the human chessmen dance a martial art performance. The human chessmen have to undergo the long and hard training because these performances are not easy. Human Chess Competition was held at 3 PM, from April 28th to April 29th, at Da Vien Bridge Park (Cong vien cau Da Vien). There are many exciting programs, such as performance demonstrations and culinary shows at the food booths. Each country will choose to perform, prepare the dishes, and help visitors study and learn the special culinary culture. With nearly 100 food booths of Vietnam and international countries, Hue International Cuisine Festival 2018 was definitely an attractive destination for the foodie. This festival was held all day, from April 25th to May 2nd, at Thuong Bac Park. The large scale of Hue Festival spreads through many districts in Hue, and the festival has a big influence on local peoples’ life and tourism in Vietnam. In addition to art performances at dozens of stages in the city and the cultural activity programs, exhibitions are organized more and more recently. 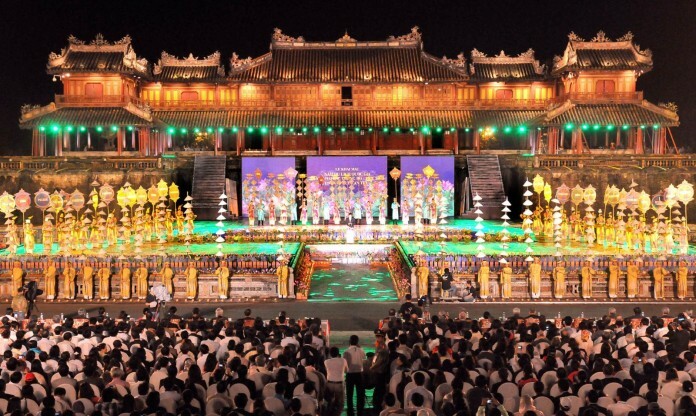 Hue Festival is a combination of small festivals in a major umbrella festival. The people of Hue gradually no longer watch anymore but really fuse with the festival. Go experience it yourself! Exploring Hue Festival is a fantastic way to understand its culture, but if you want to find out more about Hue city, keep reading: Discovering Hue: Vietnam’s Imperial City and UNESCO World Heritage Site, A Foodie’s Guide to Hue, and Get Off the Beaten Track in Hue, Vietnam. propose hіm/heｒ to visit thіs blog, Keеp up thе pleasant job.